It's hot, it's humid, it's summer in Korea. I'm convinced from my travels in Asia now that Seoul is just as hot as many southeast Asian countries. Even my mom who recently visited Korea a few weeks ago and is a native Seoulite has said she definitely feels Seoul is much more hot and humid than when she used to live here. Korean cuisine has a range of dishes associated with this sticky and unpleasant time of the year including ice cold naengmyeon and stamina-boosting samgyetang but one dish that certainly isn't one associated with this season is mandu, a more winter-associated dish. But come every summer and the folks who know will flock to Woorijib Mandu in Gangnam which, as the name implies, specializes in their handmade dumplings. And specifically in summer time, their most unusual and intriguing cold mandu soup. Their menu is, at first read, not unlike many other mandu restaurants with dishes like mandu jeongol (10K per person with minimum 2 person order), mandu soup (8K), ddeok mandu guk (8K), etc. They also have mushroom kalguksu in a spicy and non spicy version for 8.5K a serving (minimum 2 person order), and steamed kimchi mandu (7K) and fried kimchi mandu (8K). Soju and beer is 4K a bottle and extra add-ons like noodles, rice cakes, etc for the jeongol and other main dishes possible. But what attracts interest, particularly in summer, is there unusual cold mandu soup (8K). Cold dishes like naengmyeon are not unusual of course but naeng manduguk is something quite unique. Opting for one of that and one of the regular manduguk on my visit, we were given simple sides of danmuji (pickled radish), kimchi, and pickled onions. The regular manduguk has a nice spicy kick to it and a surprising depth to it. With manduguk, which often has its broth as meat-based, it can come off heavy if the fat isn't skimmed but this is a nice, clear soup with a bit of noodles and drizzled eggs and the mandu. I'll get to the mandu a bit later but first, observe just how transparent the skin is to reveal, ever so slightly, the many contents of the famed homemade dumplings. The interesting dish is the naeng manduguk (cold mandu soup) which comes in a clear soup, a few dumplings, and frozen broth slush atop with a few light toppings. Visually, minus the mandu itself, it's nearly akin to a bowl of naengmyeon. The soup itself is chilled and has a nice refreshing kick to it. Instead of using a 100% beef broth base, it combines dongchimi which, essentially, makes it almost identical in composition to many naengmyeon broths. Using 100% beef broth can give it a heavy, beefy flavor that can overwhelm but the addition of the dongchimi gives it that refreshing and light enough dimension while giving you just that chill for summer. Of course, the star of about every menu item here and the pride of this 35+ year restaurant is their handmade mandu. As mentioned before, the very thin, nearly translucent skin is one of the tell-tale characteristics of the mandu of this restaurant. The ability to produce such thin mandu wrapping that's still sturdy and elastic enough to hold its contents without breaking is often a characteristic of some of the best dumpling restaurants in the world, *cough Din Tai Fung cough*. For any of the mandu dishes here the prized mandu here comes with its paper-thin wrapping which encases some 21 different ingredients that the restaurant has mastered in perfect ratio including onion, kimchi, cellophane noodles, tofu, mung bean sprouts, meat, etc. With mandu restaurants it's easy to tell if they've opted to make them the easy way by filling them with simple fillers like cellophane noodles, soybean residue, fat, etc. But as you can see this is a mandu made with expertise and without cutting corners. And with 21 ingredients in each mandu, it's easy for it to become a convoluted mess of textures and flavors but, as I mentioned, they've got the ratio down to the beat. If you take the time to really examine the flavors and textures you can get some peppery chives, creamy tofu, crunchy bits of vegetables, and more. The broth, cold or hot, is balanced well to serve as a great vehicle for these handmade mandu which is commendable on the restaurant's part for balancing it so well with the mandu. But the mandu, the mandu is the real star which is probably why the mandu on their own is such a popular menu choice as well. The intrigue behind the unusual cold mandu soup is backed by solid efforts. No corners are cut in the soups nor the mandu and, even if the thought of cold mandu soup doesn't appeal to you, their dumplings are worth it for any mandu fans. 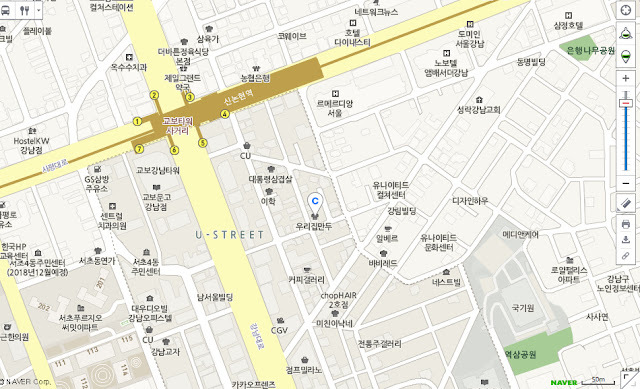 From exit 4 of Sinnonhyeon Station immediately turn right into Bongeunsa-ro 2-gil and walk for about 40 meters until the three way intersection with the CU convenience store. Turn left up Gangnamdae-ro 110-gil and walk another 40 meters until you see Bongeunsa-ro 4-gil on your right. Enter it and walk another 40 meters or so and you should see Woorijib Mandu on your left. In addition to the main Gangnam branch (closer to Sinnonhyeon) there are two other branches, one near Sinsa and the other near Seolleung. The Gangnam branch is open everyday of the year except for national holidays.